The Ugandan army says that it has killed a senior commander of the Lord's Resistance Army militant group in the Central African Republic (CAR). 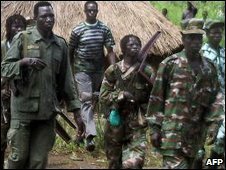 Ugandan forces have been operating outside the country's borders for a year in a campaign to destroy the LRA. Army spokesman Lt Col Felix Kulayigye said that Mr Kony was moving between the CAR, Darfur and southern Sudan in order to escape Ugandan army patrols. Bok Abudema is only one of a number of senior LRA commanders who have been cornered and killed, says the BBC's Africa editor, Martin Plaut. Others have surrendered but the LRA is scattered across a remote region of dense forests and swamps, savannah and deserts - ideal territory for guerrilla operations, our editor says.